Sony has announced April’s free PlayStation Plus games and, again, we’re getting two PS4 titles. Starting on April 2, 2019, you can download 2017’s The Surge, a sci-fi action RPG, as well as 2018’s survival game, Conan Exiles. 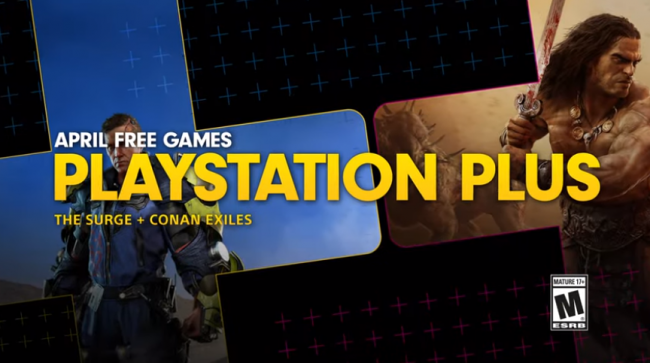 Many of us might have been expecting more perks with our PS Plus memberships, since PS Vita and PS3 games were dropped from the lineup earlier in March 2019. Since Sony hasn’t said anything about additional games or features, we can only assume they’ll be sticking with two PS4 games each month for the foreseeable future. As for the titles themselves, they aren’t bad, but arguably indicate a decline in quality over March’s free PS Plus games, The Witness and Call of Duty: Modern Warfare Remastered. As of the publishing of this article, you can still download March’s games until April 1st (and no, that’s not an April Fool’s joke). We really liked The Surge and praised its complex combat, crafting system, and level design. This is a game heavily inspired by Dark Souls, which at the time was at its peak as a sub-genre. We saw lots of developers take to that style of design and The Surge is an excellent attempt with an interesting sci-fi spin. It is worth noting, though, that in June of 2018, PS Plus subscribers were able to download The Surge: Complete Edition for free, as part of a weekly deal. It wasn’t labeled as free PS Plus game, but rather just a “sale” on the store for $0. So, you might already have the Complete Edition of this game if you downloaded it last year. The community was unsure if it was a mistake at the time or if it was intentional, since we don’t usually see free games appear outside of the PS Plus lineup. In addition to The Surge, you’ll also get Conan Exile for free, which we weren’t as wild about here. While we did praise some aspects of it like the sense of accomplishment you get after completing tasks, we had many criticisms, as well. Overall, it felt like an early access game, with janky design, poor optimization, and an unfinished feeling. At least you can play this one without spending extra money. What do you make of April’s lineup? Does it hold up in quality when compared to March’s free games? Let us know!